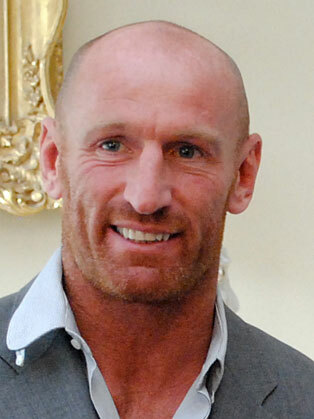 Gareth Thomas is a professional Welsh rugby player. Gareth Thomas was a professional rugby player and was the most capped Welsh rugby union player. Gareth Thomas nicknamed 'Alfie', is a retired Welsh professional rugby player, who represented Wales in both rugby union and rugby league. He was the most capped Welsh rugby union player, with 100 test match appearances until he was overtaken by Stephen Jones in September 2011. He is currently ranked 12th among international try scorers and is the second highest Wales try scorer behind Shane Williams He also won 4 rugby league caps for Wales, scoring 3 tries. He played rugby union for Bridgend, Cardiff, the Celtic Warriors and Wales as a fullback, wing or centre. He announced publicly that he is gay in 2009. In December 2009 Thomas was voted top of the Pink List in 2010 of the 101 most influential gay people in the UK and he received Stonewall’s Hero of the Year award in October 2010. Thomas is a supporter of Childline and is co-founder of Distinct Management and PR with his manager Emanuele Palladino.